The purpose of SFPE International is to advance the science and practice of fire protection engineering and its allied fields, to maintain a high ethical standard among its members and to foster fire protection engineering education. The mission of the Chapter is to reinforce the Society's purpose here in Southern California. As we settle into a new year, it is nice to reflect on some of the highlights from 2018. SFPE SoCal kept an interesting line up with great keynote presentations at our monthly meetings under the watch of Programs Chair Michele Knight Vail. We were especially fortunate to have SFPE President JC Harrington attend and present. Our third annual Fire Protection Engineering Symposium was very successful. Not only were the topics and speakers interesting, the exhibitors showed us plenty of new technology! Thanks to the exhibitors and speakers for their time and support. Under the leadership of Symposium Chair Chris Reimer, we were able to raise over $8,000 towards our scholarship fund. The SFPE SoCal Third Annual Charity Golf Tournament was also a huge success. Players enjoyed a great day of golf at Alisa Viejo Country Club. This charity event raises money for both the SoCal SFPE Scholarship and also the University of California – Irvine (UCI) Burn Foundation. This year $12,000 was raised and donated to both causes. This event would not be possible without all of the wonderful sponsors who made the day even better with their raffle prize donations to the UCI Burn Foundation. Many thanks to Ozzie Mercado and Ryan Rigsbee for their volunteer efforts on the committee. The SoCal SFPE Board granted scholarships to five students enrolled in the Fire Protection Engineering program at Cal Poly San Luis Obispo. The 2018 recipients are Kai Liu, David Morrisset, Anna Santoro, Delaney Seeburger, and Michele Knight Vail. Each received a $2,000 scholarship! 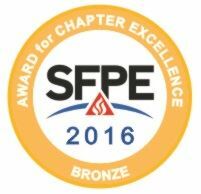 SFPE International passed out the Awards for Chapter Excellence at the Annual Conference in Nashville. The Southern California Chapter received top honors with a Gold award. Thank you to the many volunteers and contributors to the chapter activities that made this award possible. Long time SoCal Board member Debbie Freeland was inducted into the 2018 class of SFPE Fellows. Debbie was recognized for her many contributions to the profession of Fire Protection Engineering. SoCal SFPE has been certainly benefitted from her activities and is proud of this recognition by the association. Under the watchful eye of our treasurer, Evan Ross, SoCal SFPE ends the year on a solid financial foot. We established our charter and filed for not-for-profit status. Evan has done a great deal of work behind the scenes to ensure the success of our SFPE chapter. We are now in compliance with the new SFPE chapter policy, which relies heavily on a link with membership in SFPE International. Membership Chair (and webmaster) Steven Dannaway has our membership record keeping under control, as well as our website! As 2019 begins, we look forward to strong participation from our members, and perhaps meeting some new members and volunteers. The Fourth Annual Charity Golf Tournament is scheduled in February, and the Symposium Committee is hard at work planning for this year’s scholarship fund-raiser. The SoCal SFPE Board has decided to add new locations for our meetings, and we may see some new events introduced this year. I want to thank the SoCal SFPE Board for all their hard work. It is a team that brings this success, and we have a great team. We look forward to enhancing the profession of Fire Protection Engineering in Southern California. Please join me to welcome and congratulate our newest members to serve on our SFPE Board! We wish to thank Ozzie Mercado, Christopher Yang, Roland Gutierrez, and Ryan Rigsbee for their unselfish contributions to our association. Their service will be missed but we welcome their continued attendance and support with our Chapter. We are looking forward to having everyone’s attendance at our next Chapter Luncheon Meeting on June 18 at the Monterey Hill Restaurant. Please note that this is a date change due to the NFPA Conference in Las Vegas during that week. We will present our new board members to our membership at this Luncheon Meeting. Also, attached please find the contact info for our 2018-2019 Board Members. The Southern California Chapter of SFPE would like to award Mark Chase, Fire Inspector II from the Los Angeles Fire Department a Chapter Award in recognition for his contribution to the chapter and the fire protection / life safety community. It is difficult for members to stay engaged with the chapter becuase of a busy work life, but Mr. Chase has set a great example this past year by contributing to the SoCal chapter by participating in the Annual Symposium as a presenter, participating in the Wilshire Grand Tour, and making a difference in the fire protection / life safety community through your profession. Mr. Chase's dedication, humbleness, willingness to teach others, professionalism, pride and joy in the his profession truly makes Mr. Chase a great recipient of this award. Our Nominating Committee has completed their task to provide their list of nominees for serving on our Board of Directors for the 2018-2019 year. We will be voting during our monthly May luncheon meeting. A call from the floor for any other nominations will be made prior to the vote at our May meeting. Here is a link to see the individuals that have been submitted by the Nominating Committee to serve in our new year that will start in June. We thank the Nominating Committee for their willingness to serve and donate their time to provide this ballot. We look forward to having our membership participate in May to vote and support the Nominating Committee’s Ballot. The Southern California Chapter of SFPE awards an annual academic scholarship to the most qualified candidate in the amount of $2,000. The primary purpose of the Southern California SFPE Scholarship Award is to promote interest and public awareness of the science and practice of Fire Protection Engineering and to promote and encourage students to study for a career in Fire Protection Engineering. During our February Chapter meeting, it was our privilege to award five (5) scholarship awards to students enrolled in the Fire Protection Engineering degree program at California Polytechnic State University – San Luis Obispo. We wish them great success in their careers, hopefully in CA, and look forward to seeing them attend our Chapter meetings subsequent to their graduation. On behalf of our Board of Directors we wish to congratulate them for this achievement!! The purpose of our Chapter is to advance the science and practice of fire protection engineering and its allied fields to maintain a high ethical standard among its members and to foster fire protection engineering education. On October 3, we provided our second Annual Fire Protection Engineering Symposium to advance these purposes. This event was possible due to the efforts of the planning Team during the past twelve (12) months. The members of the Planning Team consisted of Christopher Yang, Gregg Vlahakis, Roland Gutierrez, Sergio Barrueto, Jeffery Halpert, and Ray Bizal. In addition, we had the following four (4) students from Cal Poly SLO volunteer their services on the day of the event to support in the registration, set up, and wherever they were needed. The students attending were Delaney Seeburger, Jacob Ludeman, Alex Dowdy, and Jacob Dentici. Dr. Richard Emberley, Asst. Professor at CAL Poly, gave a presentation on the Masters Fire Protection Engineering program. Also contributing to the successful registration of our event was Michele Knight-Vail and Steven Dannaway. I personally want to thank all of our Board Members for their support and willingness to host this event. Our 2016 Symposium generated over $4,400 towards scholarships and our 2017 Symposium will contribute another $7,300. The total available funds for scholarships is now over $11,700. We currently are accepting applications for scholarships that are due October 31 and applications will be awarded by December 31. I am confident that all those who attended our Symposium felt that their time was well spent as they received valuable information from the various speakers/topics. The speaker’s PowerPoint presentations are now available for members on our website. Just click on the “Member Only Content” to view the presentations. Our Southern CA SFPE Chapter is excited to announce that one of the eight individuals is a member of our Chapter. Please congratulate Tina King for her commitment to the Society and being recognized as a Fellow! We thank her for her dedication and contributions, and look forward to rely upon her leadership in moving our great profession forward. Again, please congratulate Tina as a member of the the 2017 class of Fellows! Tina King is a registered P.E. in Fire Protection in the State of California. She started her early career in the 1990’s with IRI (Industrial Risk Insurers), where she gained her solid background in fire protection through their extensive hands-on training program. Over 15 years ago, using the SFPE Reference Manual as a guide, Tina developed on-line P.E. Review Sessions that she taught internally to her peers to help more engineers within the company pass the P.E. Exam in Fire Protection. The Review Sessions were a success and proved to help her colleagues pass the exam. Over the years, her P.E. Review Sessions were offered outside of her organization, and today, through a partnership with the SFPE, and with the assistance of many instructors, the courses touch over 100 participants globally each year. The pass rate of those who engage in the P.E. Review Sessions has grown to approximately 80%. Since the onset of these P.E. Review Sessions, the national average pass rate has increased significantly, yielding more registered P.E.’s in Fire Protection each year! Throughout her career, Tina worked as a field engineer, technical advisor, engineering field leader, and now manages large global accounts for XL GAPS, providing consultative services to help ensure proper fire protection features are in place. Nearly 40 million Kidde Fire Extinguishers involving 134 different models have been recalled. The product recall involves two styles of Kidde disposable fire exintinguishers: Plastic handle fire extinguishers and plastic push-button fire extinguishers. The recall does not include Kidde Professional or Badger branded fire extinguishers nor does it include extinguishers with metal handles/valve assemblies. For additional information on the recall, refer to the link below.